Moving right along on our house tour, the next room up is the bathroom. Or one of them at least. Each bathroom received the same treatment, so there's really no point in sharing them both. We didn't do a ton in these bathrooms but I'm really pleased with the way they turned out. 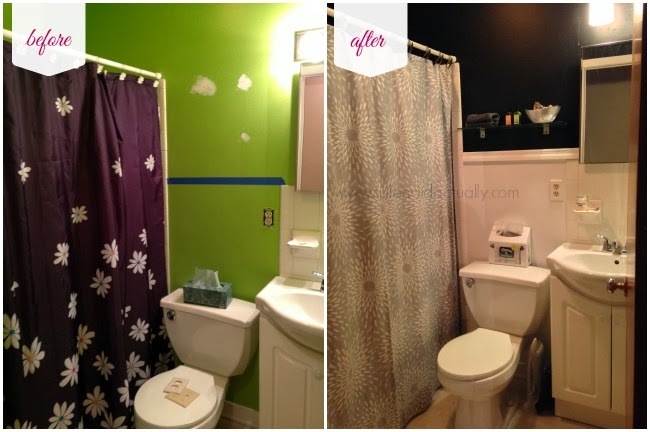 Both bathrooms were painted a bright, lime green which really wasn't our taste. It affected the lighting in the room and really made them seem small... which they are but I knew I could make them feel larger. You can see in the before photo that I divided the wall with painters tape just above the white tile backsplash. 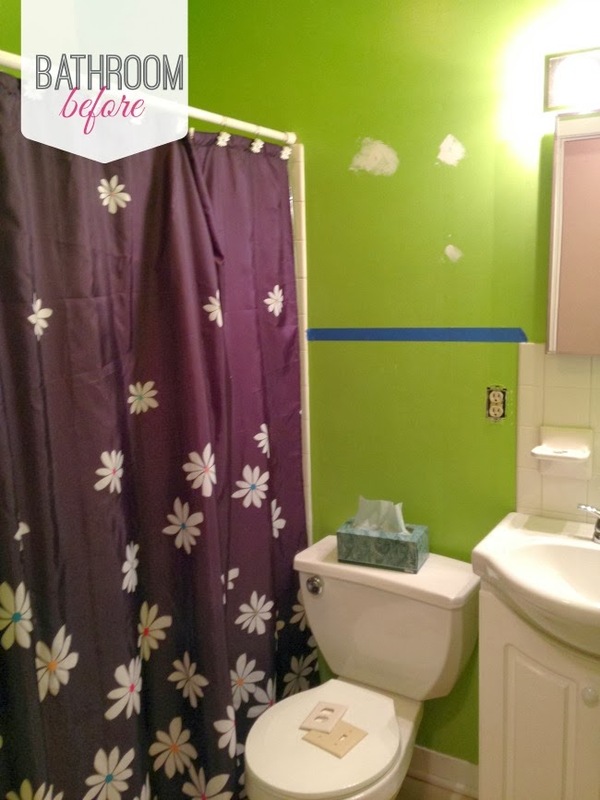 I really wanted a sophisticated black bathroom but because there was so much white in the room with the vanity, stool and wall tile, it seemed like a better idea to paint the walls white. To get the best of both worlds, I painted the top black and the bottom white. A piece of chair rail divides the two colors and keeps it really clean looking. There's not much storage in the room itself, so I added a glass shelf to keep toiletries and washcloths for guests. A small bowl holds a few of my favorite Lush soaps. It didn't photograph well in the room but we changed out the light fixture above the sink with this one from Lowes. It's more contemporary than the former one and goes better with the look of the room. I'm still looking for a decorative piece to hang above the shelf. Something gold would be gorgeous. We haven't settled on a floor yet but I'm thinking a dark gray tile like this one. What do you think?